You are here: Home / Holidays / Christmas / DIY Holiday Wreath! Today’s DIY project is a silent one. Yes, no video! I can’t talk anyway so I guess it’s best. Today we are making a temporary wreath. This Christmas wreath is a what to do with extra Christmas balls or old Christmas balls. I say this is temporary but if you want it to be permanent just hot glue the Christmas balls in place. Honestly you can do this for any season – they have all sorts of colors of these ornaments now. Untwist the hanger and make it round. Feel free to use a paint bucket or storage bucket to complete this task. Slide the balls onto the hanger. Twist the open ends of the hanger back together. Now use pipe cleaners to apply the bow. I purchased my bow at Dollar Tree and it had pipe cleaners on it so I used what came with it. 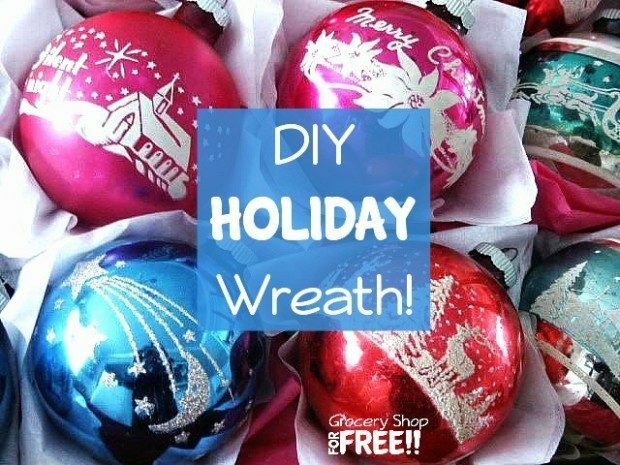 If you want your wreath to be permanent, place a dab of hot glue onto each ring that comes from the Christmas balls. Allow them to dry in place. Attach the bow to the twisted wire. That’s it! Love your blog….free is good! Lori @ bleak2unique.com » Thanks! I LOVE FREE!